With Austrians mistaking fellow Austrians as enemy Turks, the Ottomans had an easy victory (or at least that's what some accounts say)! 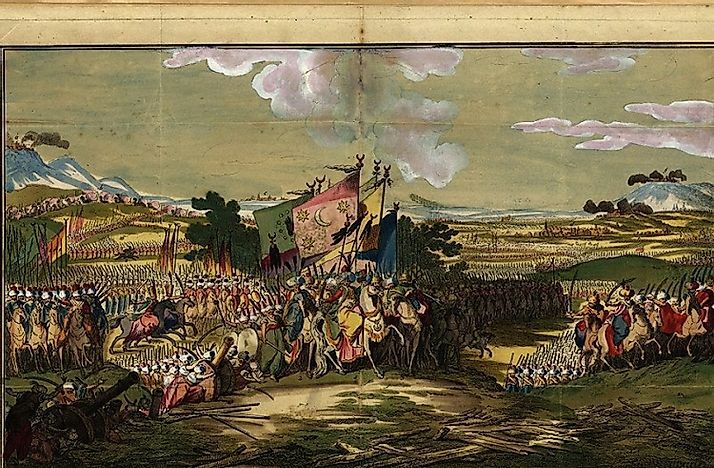 Ottoman Turks marching upon the Austrian Hapsburgs in 1788. Unfortunately for the Austrians, one of their biggest challenges came in the form of friendly fire! The “Battle of Karansebes,” supposedly took place in the town of Karansebes, in present day Romania, on September 17th, 1788. Austria at that time was fighting with Turkey for control of the Danube River. The battle started with a number of Austrian cavalrymen soldiers on a night patrol. Looking for Turkish soldiers in the area where the Austrian Army had set up camp earlier that day, the Austrian Army night patrol chanced upon some Gypsies across the river. The Gypsies offered them Schnapps to alleviate the war-weary soldiers. Seeing a chance to relax before the next day's battle, the soldiers began drinking. Later, a contingent of Austrian infantry men found the cavalrymen having a party and wanted to join in. However, the cavalrymen refused them the alcohol, and that started a quarrel that turned into a fistfight. The next thing anybody knew, a shot was fired across the river, and other infantrymen in the distance shouted, “Turks, Turks,” mistaking the gunshot as coming from the enemy Ottoman Turks. Both parties, Austrian infantrymen and Austrian cavalrymen alike, fled back to the other side of the river where they camped, but by that time, chaos and disorder had taken over. Some soldiers were fleeing due to unpreparedness, while some German officers shouted, “Halt! Halt!.” Non-German soldiers not understanding the German language, and thought it meant "Allah", referring to the Islamic Turkish making cries unto their God. This prompted the majority of the Austrian Army to start shooting at each other. Everyone commenced shooting at fellow Austrian and even shadows, thinking the enemy was upon them. Soon, an Austrian corps commander, thinking that a cavalry attack from the Turkish Army was in progress, ordered artillery fire on his own men! The casualties were enormous, and amounted to about 10,000 Austrian soldiers dead and wounded. The Turkish Army arrived two days later, and found the town of Karansebes without defense. The Turkish Army took over the town easily soon after their arrival. Although many people attest that the battle really happened, some argue over its authenticity, due to the fact that no record of it was written until some 40 years later. Some argue that embarrassment may be the cause why no accounts of the incident were published until several decades later. Others say that the Austrian Army during that time was led by Austrian and German officers, while the infantrymen were composed of other European nation allies. In that regard, for some Austrians at least, if the battle fought was won, the victory was Austrian, but if they lost the battle, the blame was on the non-Austrian conscripts. What Do You Know About The Aztec Empire?